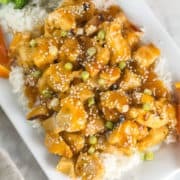 Instant Pot Orange Chicken | Healthier Homemade Chinese Takeout Fast! 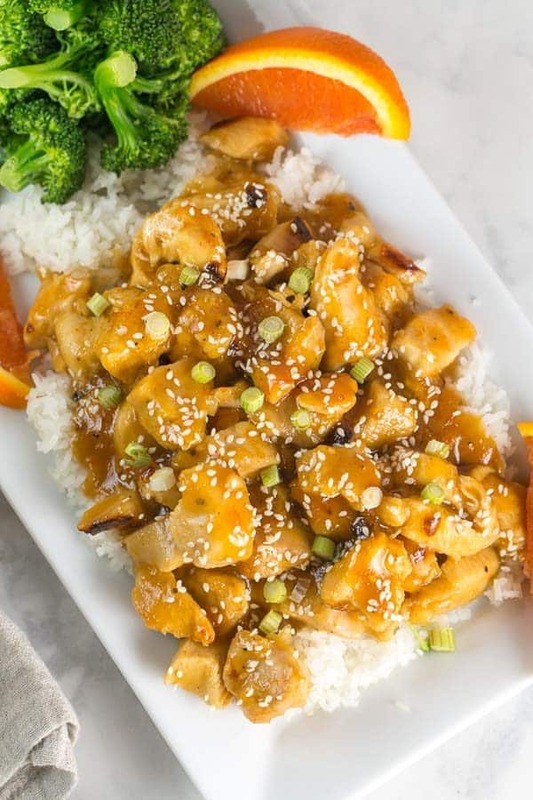 Skip ordering Chinese and make your own at home with this easy Instant Pot orange chicken recipe! All the flavor you love from orange chicken, cooked fast in the Instant Pot. Healthier and cheaper than take out? You betchya! Are you ready for another Instant Pot dinner? I was blown away by how many social media messages I received after my Easy Instant Pot Beef Stew post, so it’s pretty obvious: you guys love your pressure cookers! Let’s change things up a little with some homemade Americanized Chinese take out-fake out: Instant Pot Orange Chicken. This deviates a little from my general premise of trying to keep dinner as healthy as possible. I am usually pretty vigilent about weeding out adding excess sugar from our meals, because hi, I like dessert. 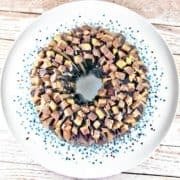 I’d much rather get my daily sugar quota from a few bites of cake than from dinner. Orange chicken, however…. well… my attempts to keep it as healthy as possible came up a little short. I tried really hard to make a really tasty, fight your Chinese food cravings, version of orange chicken with no added refined sugar other than orange juice. The end result was still good, but it was not orange chicken, and nothing that made you feel like okay, hey, this may not be orange chicken from the Chinese restaurant down the street, but I still dig it. 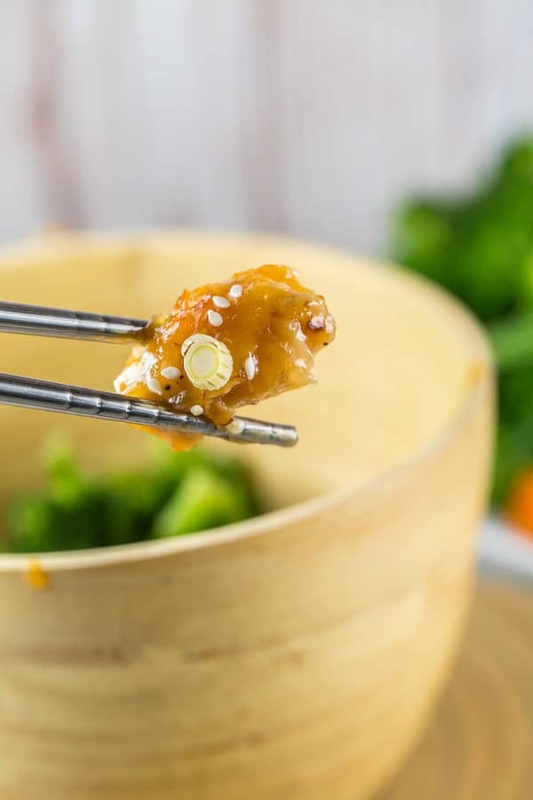 Removing that (delicious, addicting) crispy fried coating and taking out all the sugar basically means we’re not longer eating orange chicken. So… we added some back in. Health food this is not, but since the chicken is cooked in the Instant Pot instead of fried, you’re definitely making a healthier choice than ordering in Chinese, and that’s still winning in my book. I tried going the orange juice and brown sugar route, but the sauce just wasn’t orange-y enough. In the end, the best version I made used orange marmalade plus orange juice, to really boost the orange flavor. I found an all-natural orange marmalade sweetened with fruit juice and no high fructose corn syrup, but any old orange marmalade will work. The Instant Pot orange chicken itself is super easy to make: the pressure cooker does all the work for you! Saute the chicken for a few minutes to give it a little brown color, then toss in all the sauce ingredients and cook. After releasing pressure, saute again for a few minutes more until the sauce reaches the desired thickness. Sprinkle on some sesame seeds and green onions and dinner is ready. Works with both chicken breasts and chicken thighs, so it’s perfect to use whatever you have in the freezer. 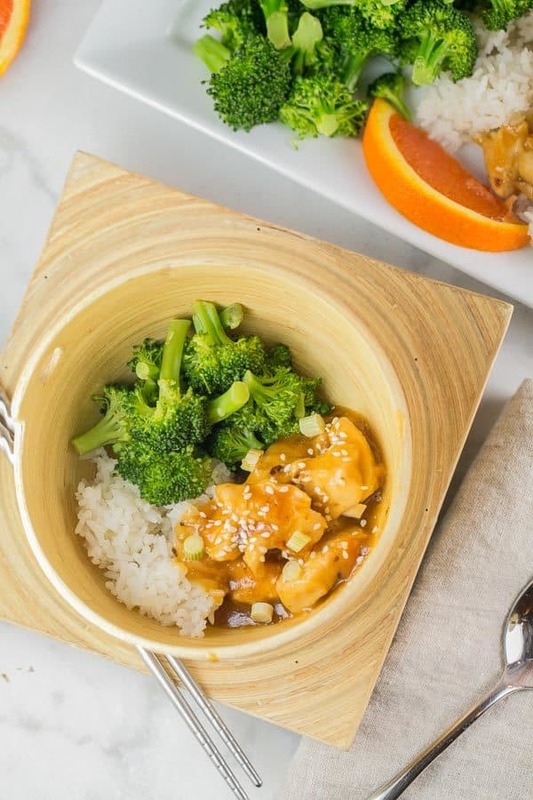 We like to serve ours with a big side of steamed broccoli and rice (cauliflower or regular), and a few orange slices on the side (because what 2 year old doesn’t love an excuse to eat oranges with dinner)? The little guy loved this so much, he requested it for lunch for 3 days in a row — but that might just be because he wanted an opportunity to show of his newly mastered chopsticks skills at preschool lunch. Today: conquering Instant Pot orange chicken with training chopsticks. Tomorrow: the world. 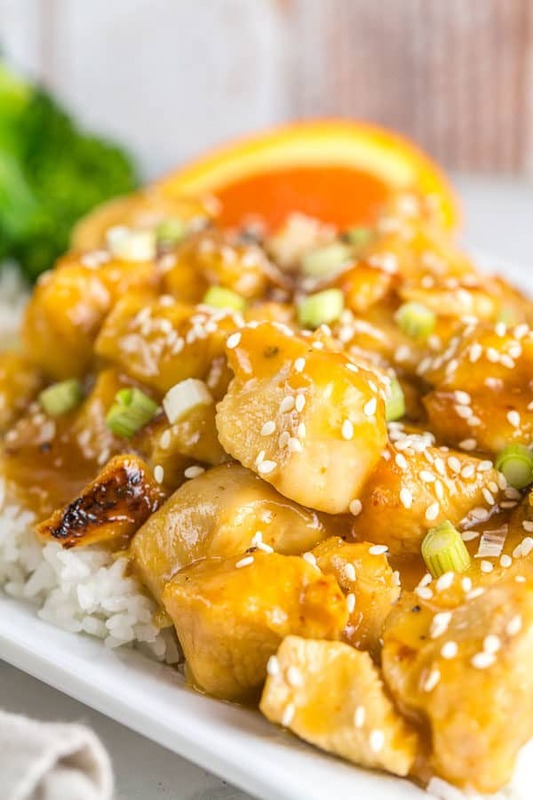 Skip ordering Chinese and make your own at home with this easy Instant Pot orange chicken recipe! 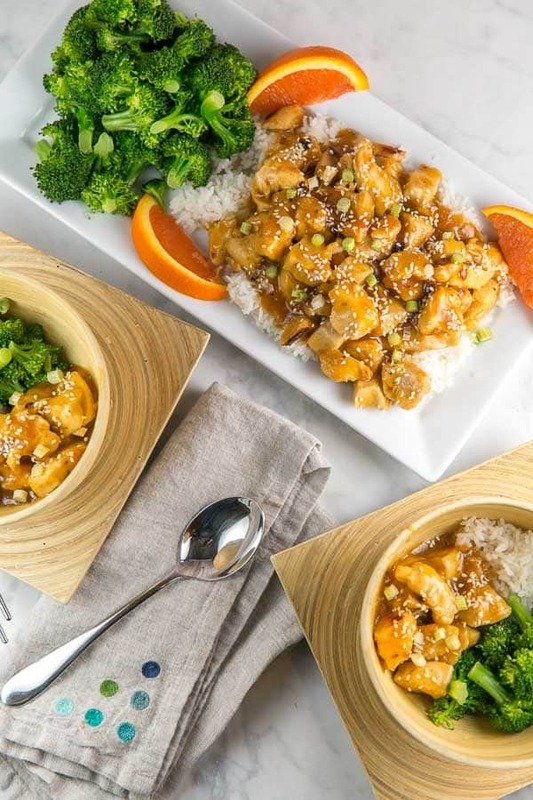 All the flavor you love from orange chicken, cooked fast in the Instant Pot. Heat the Instant Pot using the saute feature. Add the vegetable oil to the pot. While the oil heats, combine the chicken, cornstarch, and salt in a mixing bowl and stir to coat the chicken. 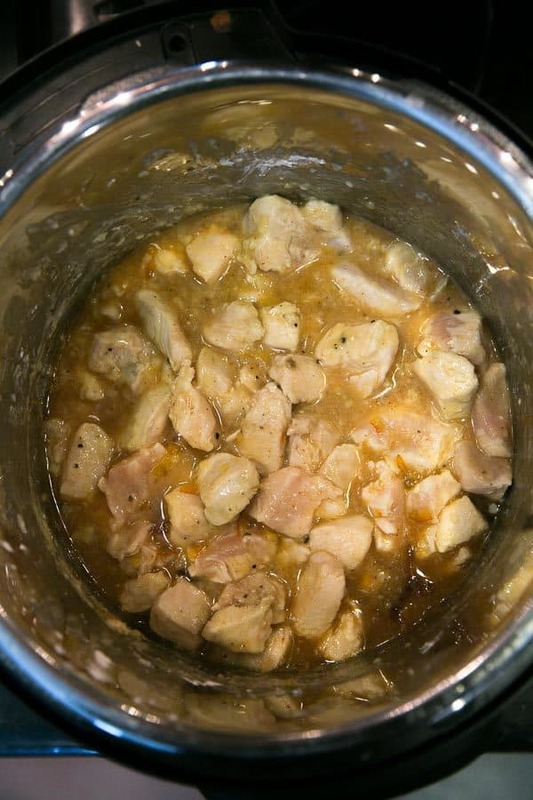 Add the chicken to the Instant Pot. Saute for 4-5 minutes, stirring frequently, until the outside of the chicken just starts to brown. 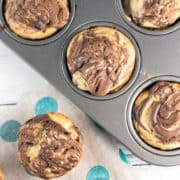 Add 1/4 cup of orange juice to the Instant Pot and deglaze the pan with the wooden spoon, scraping off anything stuck to the bottom of the pot (do not skip this step: any burned bits on the bottom of the pot may prevent it from coming to pressure). Whisk together the remaining orange juice, orange marmalade, soy sauce, rice wine vinegar, sesame oil, ginger, garlic, and sriracha. Pour the sauce over the chicken and stir to coat. Close the lid to the Instant Pot, select Manual, and set for 5 minutes on high pressure. Close the sealing vent and start – it will take 10 to 15 minutes to come to pressure. Once the pressure cycle is finished, use a quick release to vent. Once the pot has fully vented, remove the lid and select the saute function again. Saute for an additional 5 minutes, or until the sauce is the desired thickness. The sauce will continue to thicken as it cools. Serve over rice and garnish with sesame seeds and sliced green onions. Made this! 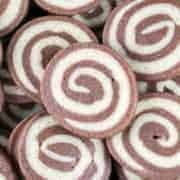 Good flavours but I do miss the crispy bits! I added a bit more salt and would likely add a splash of dark soy next time. Oh yes, it’s definitely not a total substitute for the traditional fried orange chicken! Buuuut we try to save that for the occasional time we order in, and eat a little healthier at home. 😉 You could always pan-fry the chicken in the instant pot on the saute feature for a little longer until it gets darker in color and little more seared and crispy — chicken thighs are super forgiving so I wouldn’t worry about overcooking them.